PLEASE NOTE: We offer this calendar as a help for families for the school year. Although this calendar is 95% complete, please be aware that there may be changes during the school year that will alter its contents. Thank you for your patience and understanding. If an event is followed by parentheses and a letter (A-E), the letter indicates the bell schedule for the day. 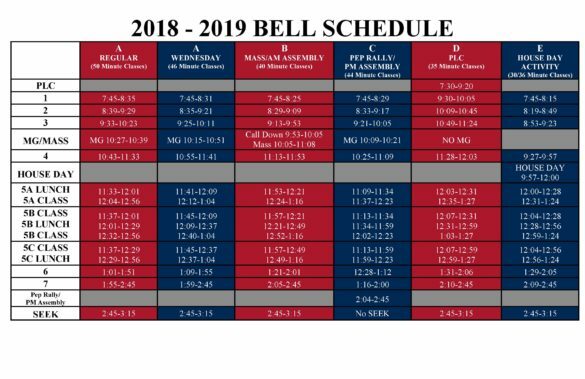 The bell schedule can be found below. 5 8th Grade Visit – All Saints Academy . Early Release – 12:00 Dismissal . Hall of Fame Game . Feast of Our Lady of Guadalupe Liturgy (B) . Winter Sports & Activities Assembly (B) . 8th Grade Parent Orientation #2 .